If you find yourself doing the same tasks over and over again in Firefox, maybe it’s time you automated some of those things. Free add-on iMacros for Firefox records your keystrokes and actions and saves them as macros. Then you can then perform recorded tasks with the click of a button. Click the iMacros button in the Firefox toolbar, and the add-in appears in the Firefox sidebar. To record a macro, click the Rec tab, then click Record. When you’re done recording, click Stop, give the macro a name, and your work is done. The macro will now appear in a list, and you can run it by highlighting it, and clicking Play in the Play tab. To get you started, iMacros comes stocked with pre-built macros, which appear in the Play tab. When you add your own, they appear in that tab as well, and you can see dozens at a time . What can you do with iMacros for Firefox? Things as complicated as logging into a webmail account like Gmail and creating a blank e-mail, or as simple as checking stock quotes. Users comfortable with scripting can make it do more as well, because you can tell it to perform more sophisticated tasks, such as performing automated, in-depth testing of Web sites. In addition, you can use it in concert with other scripting technologies, such as Windows Scripting Host, and so you can call scripts created with iMacros from inside other scripting tools. But it’s simple enough to use so that anyone can create basic macros for tasks such as checking email and getting stock quotes. I do not use Kmail, Evolution or Thunderbird on my netbook. So when I click an email link in Firefox, I get sent to the Evolution’s setup screen. 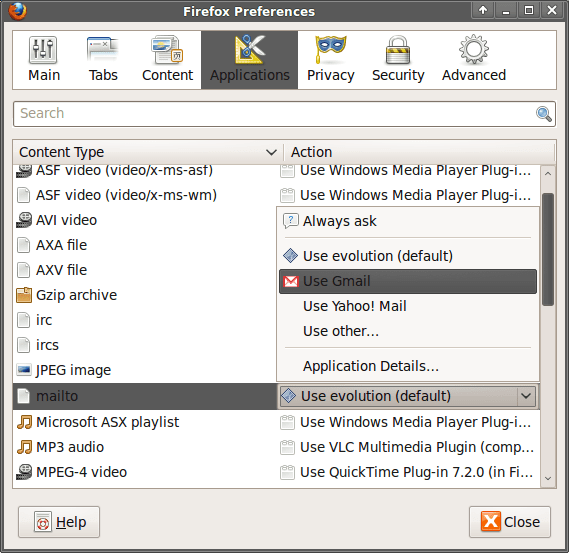 This guide will show you how to setup Gmail as you default email application in Firefox. That way, when you click a mailto link (or any email link) Firefox will open it with Gmail. *Note: this only works in Firefox 3.0 and above. 1. Go to Gmail and sign in. 2. 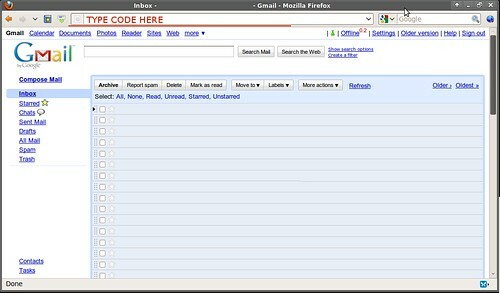 While in Gmail, copy and paste the code below into Firefox’s address bar and hit enter. – to add Gmail as an application for mailto links. Yahoo Meme is a microblogging service which is similar to other microblogging sites like Twitter, Tumblr, Pownce, etc. Following the release of its Spanish and Portuguese language versions, Yahoo! Inc. has launched its microblogging service, Yahoo Meme, in English. This microblogging service is currently in an invite-only mode and is quite similar to other microblogging sites like Twitter, Tumblr, Pownce, etc. With very few options like Meme title, 100 character description, avatar/photo and notifications, Yahoo Meme enables users to chat by creating a comment thread under the content they post. The Popular option displays the recent blog posts, just like its Twitter equivalent Trends. Google has announced that it will be soon adding three features to its search engine. The new features are Notebook, Co-op and Trends. “Notebook” lets people save web searches and interpret them. Through “Co-op” lets you to gather data from real people. And finally “Trends” lets you compare searches people have entered into Google from around the world. Click here for “Trends” and here for “Co-op”, while “Notebook” is on its way. Anyone wanting to watch just a short video on YouTube probably won’t need Minitube, for those that want more, it’s a must-have app. Don’t like the video? Click the skip button or press [Ctrl]+[Right]. With [Ctrl]+[Y] the video will open on the YouTube homepage. Here however, you will need the Flashplayer plugin to play the videos. More than this, Minitube can’t do, but generally speaking, if all you want to do is watch a couple of really good vids, what more do you need? It’s been a long time since I found a program that works out of the box and does what the blurb says it should. Minitube belongs on every multimedia PC. The Opera 10 browser is now ready to download for Windows, Linux, and Mac three months after the beta first emerged (hands-on Opera 10 beta review). If you’ve been keeping up with the beta updates, the final build of the cross-platform browser shouldn’t surprise you. Opera Turbo, the browser’s much-publicized compression engine for slow-poke connections, remains a feature highlight. Opera claims that Opera Turbo runs the browser up to eight times faster on suffering connections than do competing browsers. While statistics put Internet Explorer clearly ahead as the most widely used web browser, it’s clear to many people that it is not due to the excellent programming. Subject to more than one official inquiry in Europe, and numerous columns, both online and in print, the practice of ‘bundling’ the infamous browser with the every copy of the operating system represents the primary reason behind its crushing dominance. Alternative web browsers are aplenty and have a low barrier of entry even for less technically savvy computer users, but people are generally not keen to change their habits or spending time researching, downloading and installing another application – especially when the one that comes preloaded appears to be working just fine. 1. Firefox is not perfect software, but its vulnerabilities are fixed in a considerably shorter amount of time. Many new users are curious – is Mozilla Firefox safe? Updates are released immediately, not on a monthly schedule, and clock in at fewer than 10 MB. Users are notified automatically and prompted to install the update with a single click. The update process doesn’t take more than a minute on a modern computer. 2. Since Firefox is open source, anyone can look at the source code, anyone can spot a problem and contribute a fix. Would you leave your car keys with a guy that says “trust me” or at a car lot with video surveillance and a logbook? 3. ActiveX applets, the way IE extends the functionality of the browser, are a known highway for malware and viruses. Firefox works with verified and signed add-ons. Even if you choose to install a malicious add-on – and the browser warns you – the damage is limited to the information in the browser whereas ActiveX exploits could be used to take over the whole computer. 5. Security through obscurity; malicious programmers will always target the browser with the largest user base, especially if that user base is less tech savvy. 6. Firefox uses a service provided by Google that notifies the user before entering a potentially malicious web site. These websites ask for your financial data under false pretenses or contain malicious software often posing as something useful such as codecs or registry fixes. We check the radiator on the car when the temperature indicator turns red; by the time the computer starts acting up or not starting at all, and by all chances appearing to work just fine, your documents, passwords and financial data might already siphoned half a world away. Most people don’t realize this, there are no clear warnings, but using Internet Explorer is in itself a security threat. and archive.zip will be downloaded. But we can download files using a lot of parameters. Read on! –random-wait means to download a file and then wait for a random period of time, then download the next file and so on. –limit-rate=20k indicates that you want to download at a maximum speed of 20k so you don’t get banned. -U Mozilla will make the website believe you are using a Mozilla browser.